Actually, it's easy to say clever things these days. You hit out at the government and run down PM Najib Razak, you'll be hailed by some people as clever. Brilliant, even. Whack the 1MDB or anyone/anything that has something to do with 1MDB and you won't go wrong, even if you don't know your facts or don't even bother to read the explanations by the 1MDB management and the government. One person who's been saying a great deal of such clever things would be Nazir Razak, the Prime Minister's youngest brother. 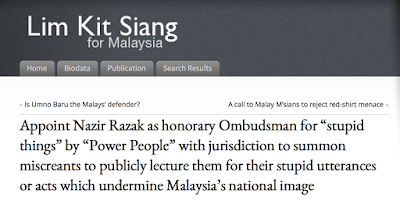 Lim Kit Siang certainly want you to think so even if you don't. So much so, the DAP's grand old man has suggested in his latest posting that Najib appoints Nazir to lead an Ombudsman to take to task Cabinet Ministers for saying stupid things. Not such a clever suggestion but that's beside the point, of course.. We know that Kit Siang is merely taking the opportunity that has availed itself to bring Nazir and his PM brother and the cabinet ministers/Umno leaders at loggerheads. 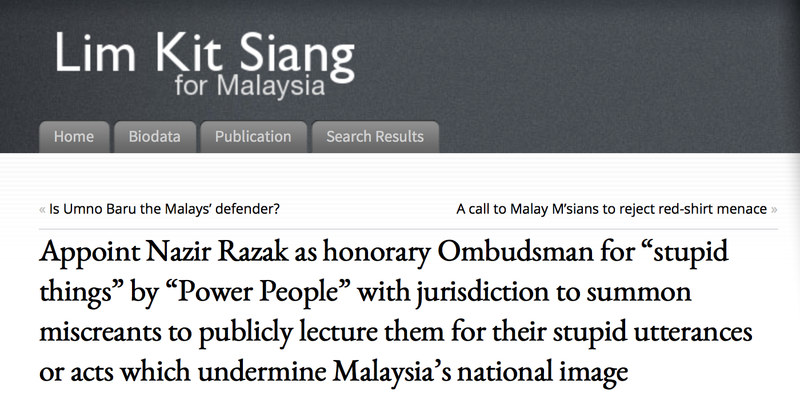 Clever or stupid, Nazir really should watch what he's saying. After all, he's one of the "power people", whether he likes it or not. And power people say the darndest things! 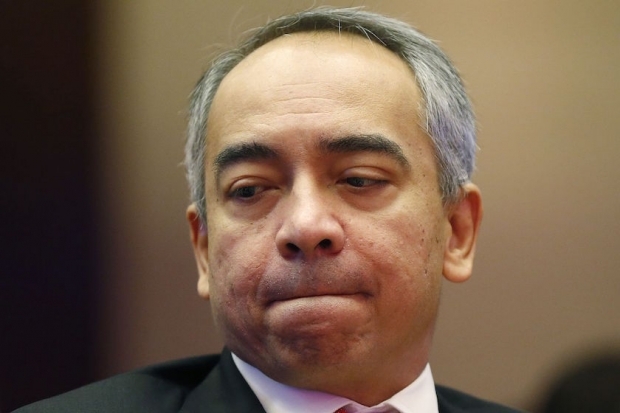 Further to the announcement issued yesterday by 1MDB on this matter, we regret to note that today, third parties such as Datuk Seri Nazir Razak, who have no direct knowledge of the facts, are issuing speculative opinions on certain statements made on 7 September 2015 by Tan Sri Samad Alias, a former member of the 1MDB Board of Advisors. 1MDB can confirm that our President and Group Executive Director, Arul Kanda, personally met Tan Sri Samad in January and March 2015 to discuss the company's affairs. Amongst other information, Arul Kanda shared with Tan Sri Samad details of the 1MDB strategic review and rationalisation plan. This included a slide presentation which showed the extent of future debt and interest obligations of the company, and a discussion on proposals to address the key issues facing the company. As for access to the 1MDB audited financials, these are publicly available documents. 1MDB would most definitely have been able to share these with Tan Sri Samad had such a request been made, or indeed repeatedly made, as claimed by Tan Sri Samad. Tan Sri Samad has the contact details of various 1MDB Board members, including the mobile phone number of Mr. Arul Kanda. However, 1MDB did not receive any “repeated requests” for information as claimed by Tan Sri Samad. It is, however, important to 1MDB that we properly address the concerns raised by Tan Sri Samad. In addition to regularly issuing public updates on the progress of the 1MDB rationalisation plan, the 1MDB Board of Directors has today sent a letter to Tan Sri Samad to seek a meeting with him to discuss and clarify any outstanding concerns. We further reiterate our appreciation to Tan Sri Samad for his earlier input and support of the company. * The headline above is mine, the statement issued by 1MDB earlier today. Actually the "power people" do enough damage to the PM already, unless the PM beats them to it. There are now 5 explanations for the "donation" floating around, all of which will be proven to be complete fabrications, just like the cash, whoops assets, whoops units in BSI Bank Singapore. "Saying things stupid: Time for Jay to watch his mouth, too"? I think the term is "padan muka". PS: Oh, by the way, the WSJ are STILL waiting to be sued. We'll hit the 3 month mark soon. Is it because the US govt already went through the records of Wells Fargo bank, and already know who is behind Tanore Finance? This is gonna be funny to watch. Tan Sri Datuk Dr. Abdul Samad Haji Alias is bluffing, eh? "KUALA LUMPUR, July 11 — The hurried signing in 2009 of 1Malaysia Development Berhad’s (1MDB) now-aborted deal with PetroSaudi International (PSI) had led to two board members resigning from the Finance Ministry-owned company, investigators have revealed. According to The Star today, former 1MDB chairman Datuk Mohd Bakke Salleh and board member Tan Sri Azlan Mohd Zainol quit in protest after US$700 million (RM2.6 billion) that was meant for the 1MDB-PSI joint venture were diverted to another company without the board’s approval. Bakke resigned on October 19, 2009, while Azlan left the board earlier this year on January 11, it said. Again quoting investigators, the English daily said board members also felt the agreement with PSI to set up the JV firm was signed too hastily. The report said the board was informed of the deal on September 18, 2009, and 10 days later on September 28, the agreement was inked with PetroSaudi Holdings (Cayman) Ltd, a wholly-owned subsidiary of PSI. Initial findings by investigators, however, showed that there was no document on the existence of assets and valuation of PetroSaudi Holdings (Cayman) at the time the deal was signed." So Datuk Mohd Bakke Salleh and Tan Sri Azlan Mohd Zainol are liars too? It seems that only govt-sponsored spinmasters have the real facts about 1MDB. The fact that the Swiss and Singapore govts have frozen accounts related to 1MDB transactions is - what? But are Datuk Mohd Bakke Salleh and Tan Sri Azlan Mohd Zainol part of a Komplot Yahudi? No, I do not think so, not for one second. I think they're telling the truth. As far as I am concern, Nazir dengan abang dia sama saje. Naik bukan kerana merit. Who cares about Nazir. The real devil is not 1mdb, but the guy who quits. The saint is of course, Najib. Dia boleh leraikan benda ni macam tu saja. For reasons known to many, the guy does not want to go to jail.